You remember that awesome recruiting workshop I just talked about a couple of days ago? yeah… I’m going to talk about it for the next 6 months probably. I get excited when respectable, experienced pros start talking about social media and its role in todays work place. The most obvious thing Tim talked about that made me go durhhhhh was the Facebook page for Facebook recruiting. Facebook is a little scary to personally recruit with because there are a bazillion creepers out there. At a previous job I made a page just for my office (to avoid creepers), but why didn’t I think of just having my own page and having each of my recruiters have their own page? Hindsight. This totally just reminded me of another thing that I had been introduced to for Facebook recruiting: the monster.com BeKnown app. Two problems with it: 1) Monster is not my favorite and 2) Just reading that it keeps your personal and professional life separate exhausts me. Separating your personal and professional life is another topic that we touched on. I’ve been asked before “Why do you use your twitter for personal and professional? Why don’t you just have two separate accounts?” I use the same account for everything because it’s exhausting to have multiple accounts on the same social media outlet. For the most part I am completely myself on my social media accounts and the fun thing about that is, I’m not such a terrible person that I need constant censorship AND I am a recruiter 24/7 so it is part of my personal life. The one thing that I’m not as careful with, though, is making sure I’m sharing relevant information for my targeted audience. It’s okay to share stuff you like, but if it’s not relevant to the people you are trying to attract to connect with you don’t be surprised when you are not making those connections, ya dig? The biggest thing you can do to be successful in this arena is make sure you are giving your audience more than you are taking from your audience. I’m the worst about sharing things irrelevant to my targeted audience these days because I will share something that I think is funny in a heartbeat, or an HR article in half a millisecond without thinking about those EEs or CEs that don’t care about that stuff. This is where my social media recruiting needs improvement, lots of it. (See, its okay to not be perfect with your #SoMe efforts from day one. Don’t let that scare you). 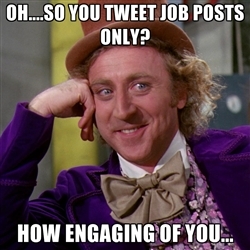 By all means, avoid just sharing job posts. Always give more than you take. And reply to people! 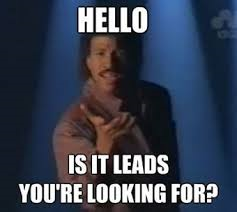 The main thing you need to know about using social media for your recruiting efforts is that it does not replace the telephone. Those of us who push social media recruiting push it because it helps you, not because it replaces anything. It’s a form of marketing to attract the talent you need. It works for you when you’re not working. Much like HR technology it is just a device to make your recruiting work faster. It is another tool in your tool belt! It is not the end all be all. It is not a replacement for the telephone. Just in case you are confused, NO it does not replace the telephone 🙂 . Pick up that phone and call people! Social media does not take the social function out of recruiting, you still have to develop relationships with people and have voice to voice conversations. I love social media and I love it when other HR folks love social media. If you have been thinking about taking that social media step, but you have questions or you are worried, email me (hutto.ipad@gmail.com)! If I don’t know the answer I bet I know someone who does! If you have a great tip, please feel free to leave it in the comments below, I’d love to hear what you’ve found works for you.